People keep telling me there’s more to Canada than just Timbits and arctic wasteland, but then I see a snow plow truck get slammed by the fury of a stormy sea and I think yeah, no, the weather doesn’t mess around up there. 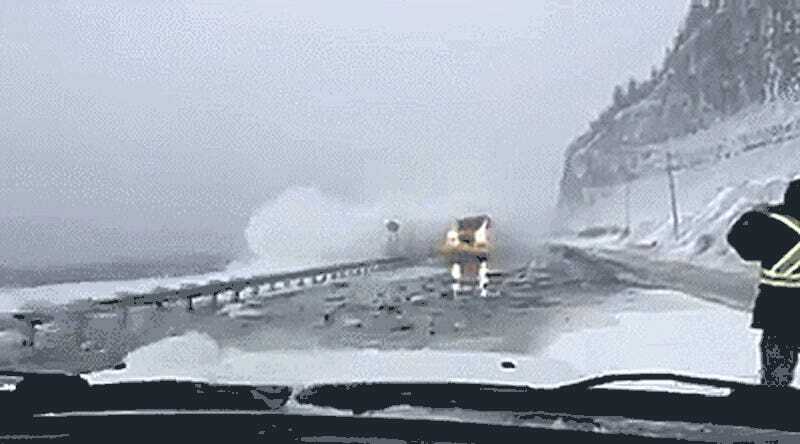 The Canadian broadcasting outfit ICI Gaspésie-Les-Îles shared this dashcam clip last week from Route 132, in the Gaspé region of Quebec, Canada. One of our readers who sent this video over explained it’s right about where the St. Lawrence River meets the Atlantic Ocean. 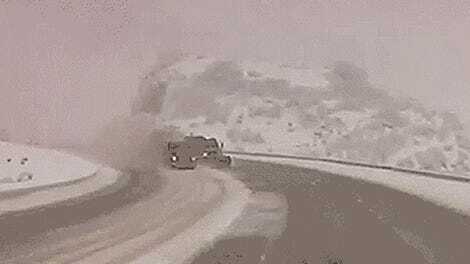 Amazingly the plow truck in this video shrugged off the sea’s savage assault, but I’m pretty sure you can see it rusting before your eyes even through this grainy, foggy dashcam clip. Since Route 132 is effectively a sea wall, it has a hard life. Apparently the ocean takes bites out of it on the regular. Man, and I thought plow work was tough when you only had snow and ice to worry about.